As videogame collectors, sometimes we obtain games for systems we don’t even own. It just happens; other people might ask us why, but we don’t need to explain it to them. Mostly because we can’t. 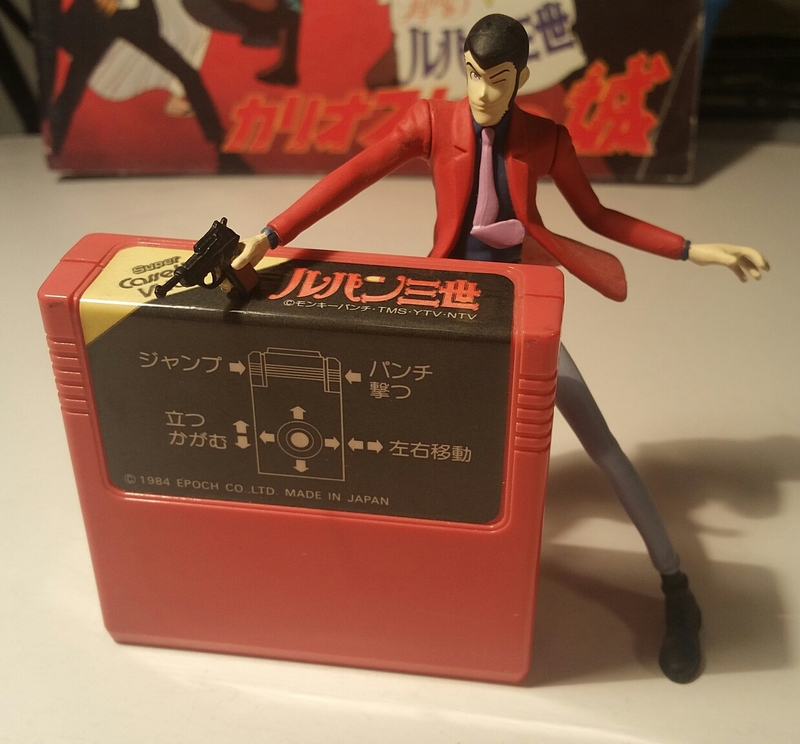 Anyway, I’m a big fan of the classic anime Lupin the Third, and I have several games based on it for systems like the Famicom, Game Boy, Super Famicom, and PS2. (There are more. I don’t have them all.) So when I happened across this little red cart with the Lupin III logo on it at Midwest Gaming Classic years ago (back when it was still in Oconomowoc), I naturally had to snap it up because a) Lupin, b) videogame, and c) I had no idea what it was. A little research turns up some info on the Super Cassette Vision console: released by Epoch in Japan in 1984, it was the follow-up to their 1981 console, the Cassette Vision. The SCV was similar in power to the Colecovision and had a fair lineup of original games and arcade ports. Predictably, the console didn’t fare very well in competition with Nintendo’s Famicom. This Lupin game is sort of a Pitfall-esque run/jump/punch platformer, where you play as Lupin and have to make your way through environments and obstacles, avoiding capture by Inspector Zenigata. You can find emulator footage on YouTube, should you wish to see it in action. I would totally buy a Super Cassette Vision console just to play this. The game itself doesn’t look great, but as a Lupin fan and gamer it’s a proud little piece in my collection!